Some places on this planet offer undiscovered mysteries…from the first day on the island of Fuerteventura, the natives warned us, the Canaries islands have a special power of attraction…coming from the high mountains, it is a strange magnetic vibrations that bewitch whoever put his feet on the island. Everyone who went for even just one day on these islands will never be able to forget them…and somehow will be always attracted by this unique force…heritage of the Atlantes civilization. Mystic energies or simple marvel of the nature…the Canaries Islands are without any doubt a special place with old and mysterious cultures, wonderful landscape with luxurious jungle, arid desert and volcanic beaches. The Locomotive arrived on the island of Fuerteventura full of positive energy and ready to take the first boat for the other side of the Ocean. However, Nicola, Raphael and Benjamin are not immune to the spells of the island. Therefore, without even realizing it, days pass and weeks…they enjoy the great beaches, the relaxed atmosphere, and the desert, fertile place for the thoughts…every single person they met offer them a smile, some bread or a complete and delicious meal. The generosity they had encounter in Morocco followed them until here. 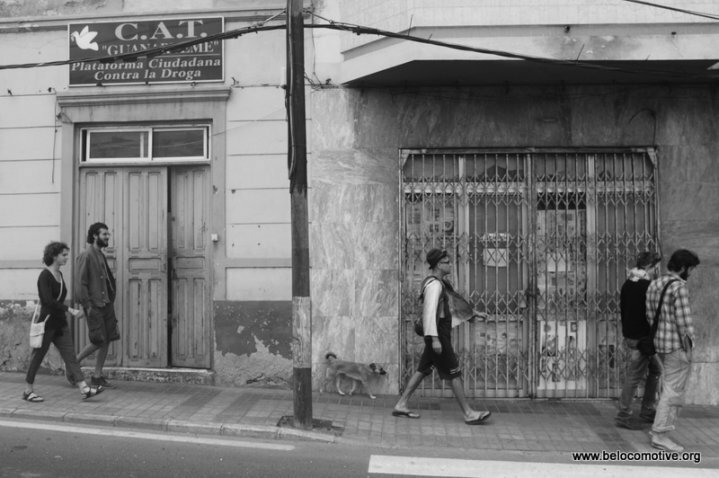 Spanish, Canarios, Moroccans, Brazilians, Cubans, Belgians…not one refuse to give them a hand. 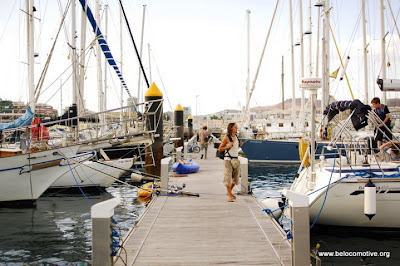 To cross, the trio first had to reach Gran Canaria and the harbour of Las Palmas, meeting point of all sailors of the world who dream to get to the other side of the Ocean. Sort of confirmation that the Belgians are the best sailors of the world, Wim offered to the locomotive to take them to Gran Canaria…giving them a little push toward the right direction. Wim is the founder of the Clean Ocean Project, an organisation who aims to sensibilize the people to the respect of our mother earth with for instance the planning of beach cleanings. With his majestic 9 meter, he brings the locomotive until the harbour of Las Palmas, one of the biggest harbour of this part of the Atlantic. Nicola, Raphael and Benjamin discover a complete different world, a capitalistic refuge that contrast with the pacific atmosphere of the island…as if Europe wanted to prevent the Canaries Islands to become a paradise of peace and harmony. The water remains transparent and the mountains wonderful, but huge gray and monotone buildings grow everywhere, streets are full of stressed people and the car traffic never stops…In front of this society too modern, the Locomotive runs into in a squat, “la Tomatera”, small alternative world growing in a house abandoned by the housing speculators…the whole neighborhood had been bought by a investment company, and they left everything with the crisis. Thanks to a couple of youngsters, the place is now open to everyone, cultures from all over the world come to live or to stay some days to share good moments. Italians, Spanish, Argentines, American and Croatians live there giving space for the development of a unique creativity. The walls are all painted and all furniture are recycled, they recollect the water they use to wash dishes for the toilet, recycle the food and they organise workshop where people can learn handcraft or watch cultural movies. It is like an oasis of good vibrations offered by Pietro, Marcela, Indiana, Pascuale, José, Tena and Gogi in the middle of a materialistic desert.Las Palmas is one of the biggest harbour of the East Atlantic, a place of transit where most of the boats stop to repare their boats, get some food and relax. Thus, “el puerto de la luz” is the perfect place to start a journey to America of the Cap Vert. More than 600 sailing boats leave this harbour every year for the Caribbeans, the majority between October and February to spend the winter there and come back to Europe for the summer. Outside of this period, just a few boats are leaving, the “late” ones… giving hope for everyone to cross until July when the hurricane season starts. 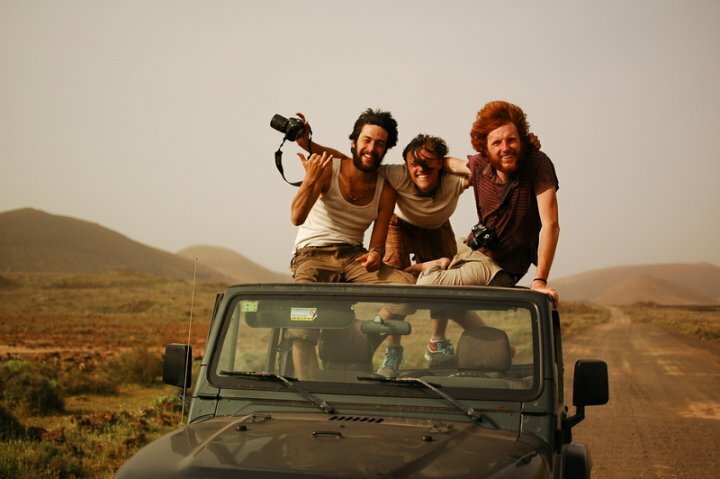 Nicola, Raphael and Benjamin are therefore not in the best time to find a boat. The searching is harder but there are boats, opportunities to cross, most of the time they don’t need extra crew but confirm that people are sailing even at that time and that everything remain possible. After one week waiting at the harbour, the Locomotive decides to keep on traveling a little bit to go in the south of the Island to check the harbours of Puerto Rico and Mogan and discover a bit the Island. 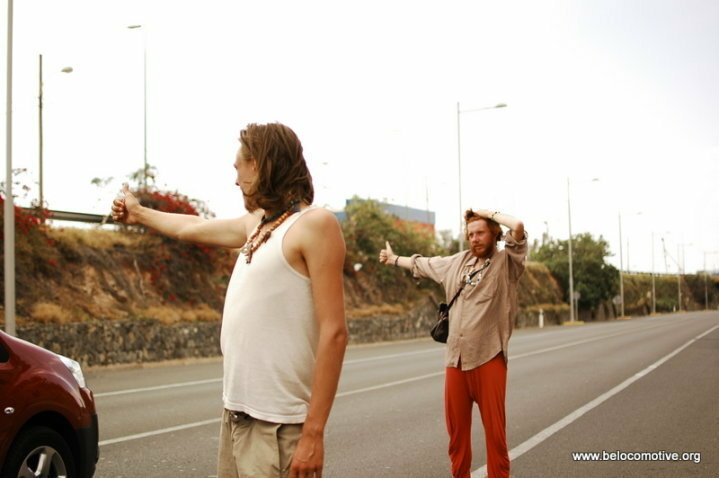 They found themselves on the road again,meet new nice drivers who take them quickly to the south, a true paradise where tourist that can choose between hundreds of Hotels. Tourists mean abundance of food, they recycle in the restaurants and enjoy the generosity of many…especially the Italians who don’t hesitate to prepare good vegetarian pizzas for the three adventurers. 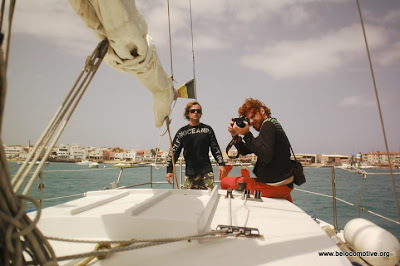 In each harbour, the same refrain :”it not the season for crossing”, Nicola, Raphael and Benjamin are aware of that…no problems…after more than 7000 kilometers nothing can discourage them. They keep on going, discovering the in lands until San Nicolas, small town in the mountains where the explorers can learn more about the Canarian culture. They meet Ivan, a proud Canarian who show them the jump of “el pastor”, he offer them to sleep in a traditional house and wake them up with the Gofio, toasted flour base of the Canarian nutritional pyramid.